If you ever want to progress beyond the very basics of guitar playing, then you need to learn how to play and make use of barre chords. The problem is, guitar barre chords are hard to play! 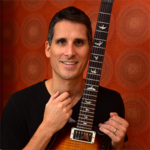 In this free guitar lesson I give you some pointers on how you can make playing barre chords easier. 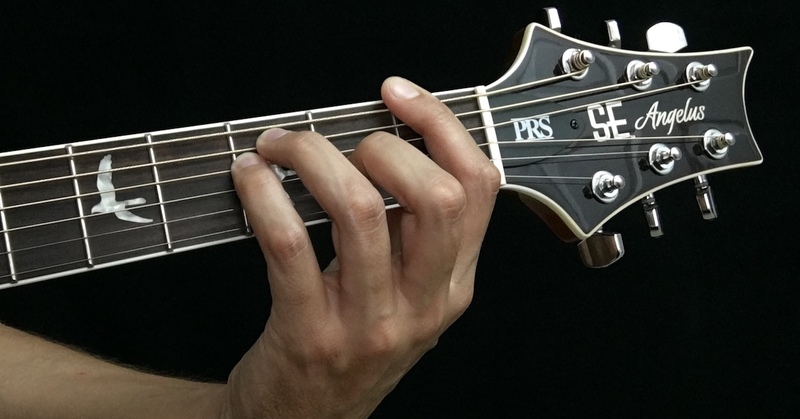 The thickness of your guitar strings (called the gauge) and the gap between the fretboard and the strings (called the action) effect the playability of the instrument. The thicker and higher the strings, the harder they are to press down. This becomes especially difficult when you need to lay one finger across multiple strings as is necessary when playing barre chords. The solution is to lower your guitar’s action by making adjustments to the truss rod, nut, and bridge. This process is called a set up and is best performed by an experienced guitar tech. In addition to decreasing the gap between the fretboard and strings on your guitar as mentioned above, you can change to a lighter gauge of strings, which is more necessary on an acoustic guitar than on an electric guitar. Because acoustic guitars are intended to produce loud, optimal tones without the aid of magnetic pickups and amplification, they are strung with thicker strings. While thicker strings produce a better tone, they also make barre chords harder to play, at least for guitarists who are just getting started with playing barre chords. A good temporary solution is to change to a lighter gauge of strings that will make barre chords easier to play. As your hands get stronger and more coordinated over time, you can switch back to thicker strings in order to maximize your acoustic guitar tone. If you’re playing an electric guitar, then you probably only need to lower the action without changing the strings. I traveled around and played acoustic music professionally for many years. I used smaller bodied, semi-hollow and even solid-body acoustic/electric guitars strung with .010 gauge electric guitar strings. These guitars were amplified through PA systems. Though I didn’t get the best acoustic guitar tone, the sound was good enough for live performances and much easier on my hands and fingertips (especially when I had to play three one-hour sets of music each night for several days straight). With the lighter strings, I was even able to play lead guitar solos and bend the strings (which came in handy whenever the song “Wish You Were Here” by Pink Floyd was requested, which features acoustic guitar bends). Before you try to tackle full barre chords, you can prepare your hands in steps by focusing on partial shapes. For example, with E form barre chords along string 6 you can just finger strings 6, 5 and 4 and play power chords. Or you could just finger strings 5, 4 and 3 (this would be a fifth, root and third which makes a full chord). Be sure to only strum the strings you’re fretting. Another partial example is the common F chord played in the first position. It’s actually just part of a full barre chord with strings 5 and 6 omitted. This chord shape can be reduced further by only fretting and strumming strings 2-4 or 1-3. In situations where you play chords along with other instrumentation, breaking up the chords like this and, in some cases, omitting the root sounds fine. You can move this shape around the neck and use it in place of full barre chords (just be sure to only strum the strings you’re fretting). Jimi Hendrix was famous for using a partial shape and then wrapping his thumb around the neck to fret the root on string 6. If you can’t wrap your thumb, then skip it. If it’s necessary to play the root, then use a power chord and skip the other portion of the barre chord. You can experiment with the same options when playing the common A form barre chords. Perhaps a simple power chord will work in place of a whole barre chord, or perhaps reducing the shape to only three or four strings can work. Whatever you do, pick an option that works well for your hand and enables you to complete the set of chord changes you’re attempting to play. As your skills improve over time, slowly work toward adding more notes to your barre chords and trying different fingerings until you’re comfortable playing the full forms. Keep in mind that while it’s good to be able to play complete barre chords, it’s not always necessary. Guitarists typically make use of partial chord shapes, not because they’re incapable of playing chord forms in their entirety, but because partial chord voicings often produce the most desired sound. This means that you should teach yourself to play partial barre chords not only to help make barre chords easier to learn, but to help you understand how chord shapes are used in music. Another reason to learn partial barre chord shapes is to give your hand a break during barre chord-heavy songs and long playing sessions. 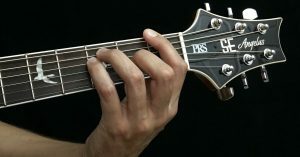 If you need to play barre chords through an entire song with few to no breaks, then change up your fingerings in order to prevent your hand from cramping. Finally, as you learn to play barre chords, start with simple songs played at slow tempos. Be patient and gradually work toward improving your skills over time in small, incremental steps. After you become comfortable with playing and using barre chords, you can continue your guitar-learning journey by learning more about guitar chords, scales, progressions, modes, music theory, and more. I cover all of these important elements of popular music in my instructional video series, Fretboard Theory.